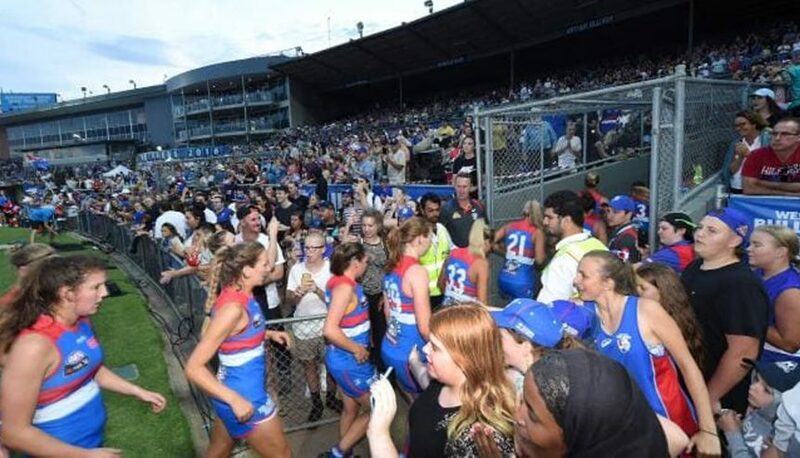 The Western Bulldogs want to turn the Western Oval precinct into a “Mecca” for AFLW football as they work on ambitious plans for a new $16 million parcel of land. The Dogs last week declared a profit of $18.04 million after being handed control of the parcel of land adjoining their current facility by the state government. The club plans to redevelop the land with commercial ventures and will soon release a master plan for an area including Whitten Oval and the Western Oval precinct. The Dogs will soon sell their entire investment in poker machines and will need to replace the $1.6 million profit the club makes annually from those machines. But with its small level of strategic debt offset by $7.9 million in cash reserves, the Dogs have never been in a stronger financial position. The club writes in its director’s report that bringing fans back to the club to watch big games is part of the plan to continue boosting profits. “Big-time football matches and spectating are coming back to our historic Western Oval. We hope to share our initial master plan ideas with our members soon. “The new Western Oval will be a mecca for AFLW football. It will provide a new, warm and very West Footscray way to come together with your fellow Bulldogs and support our teams. “It will be exciting. It’s the most ambitious project in our history. “It will be necessary for the club to work hard to replace and build on these revenues.